Judge of Israel during six years (Judges xii. 7); conqueror of the Ammonites. According to Judges xi. 1, he was a Gileadite, son of Gilead and a harlot. Driven from his father's house by his father's legitimate sons, he settled in the land of Tob as chief of a band of freebooters (Judges xi. 3). On the occasion of the war with the Ammonites, Jephthah's aid was sought by the elders of Gilead and obtained on the condition that they would accept him as their chief; and he was accordingly solemnly invested with authority at Mizpah (Judges xi. 4-11). Before taking the field, Jephthah resorted to diplomacy, sending an embassy to the King of Ammon. This failing, Jephthah attacked and completely defeated him, taking from him twenty cities (Judges xi. 12-33). The most prominent act in Jephthah's life was his vow to sacrifice to Yhwh whatsoever came first out of his house to meet him if he should return victorious. His vow fell upon his only daughter, who came out to meet him dancing to the sound of timbrels. Jephthah, having given her a respite of two months, consummated his vow. After this it became the custom for the daughters of Israel to lament four days in every year the death of Jephthah's daughter (Judges xi. 34-40). After the war a quarrel broke out between Jephthah and the Ephraimites, who reproached him for not having called them to take part. Having seized the fords of the Jordan, Jephthah required every fugitive who attempted to cross to pronounce the word "shibboleth." Those who betrayed their Ephraimite origin by saying "sibboleth" were put to death; in this manner 42,000 Ephraimites fell (Judges xii. 1-6). 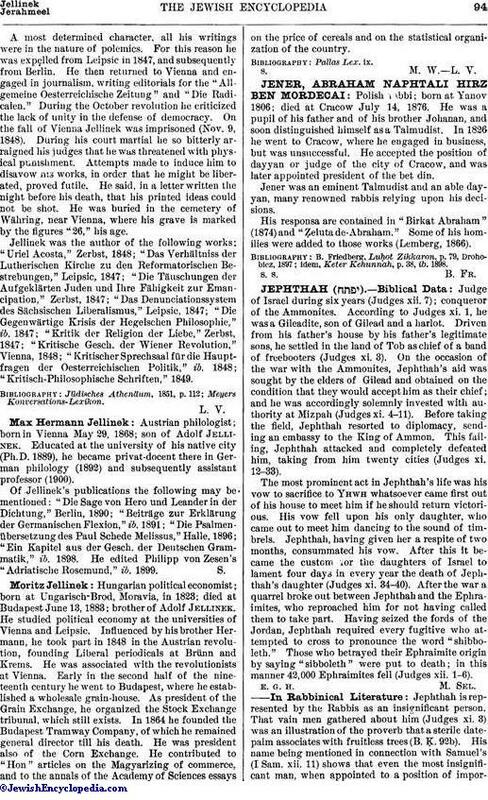 Jephthah is represented by the Rabbis as an insignificant person. That vain men gathered about him (Judges xi. 3) was an illustration of the proverb that a sterile date-palm associates with fruitless trees (B. Ḳ. 92b). His name being mentioned in connection with Samuel's (I Sam. xii. 11) shows that even the most insignificant man, when appointed to a position of importance,must be treated by his contemporaries as if his character were equal to his office (R. H. 25b). He is classed with the fools who do not distinguish between vows (Eccl. R. iv. 7); he was one of the three men (Ta'an. 4a), or according to other authorities one of the four men (Gen. R. lx. 3), who made imprudent vows, but he was the only one who had occasion to deplore his imprudence. According to some commentators, among whom were Ḳimḥi and Levi b. Gershom, Jephthah only kept his daughter in seclusion. But in Targ. Yer. to Judges xi. 39 and the Midrash it is taken for granted that Jephthah immolated his daughter on the altar, which is regarded as a criminal act; for he might have applied to Phinehas to absolve him from his vow. But Jephthah was proud: "I, a judge of Israel, will not humiliate myself to my inferior." Neither was Phinehas, the high priest, willing to go to Jephthah. Both were punished: Jephthah died by an unnatural decaying of his body; fragments of flesh fell from his bones at intervals, and were buried where they fell, so that his body was distributed in many places (comp. Judges xii. 7, Hebr.). Phinehas was abandoned by the Holy Spirit (Gen. R. l.c.). The Rabbis concluded also that Jephthah was an ignorant man, else he would have known that a vow of that kind is not valid; according to R. Johanan, Jephthah had merely to pay a certain sum to the sacred treasury of the Temple in order to be freed from the vow; according to R. Simeon ben Laḳish, he was free even without such a payment (Gen. R. l.c. ; comp. Lev. R. xxxvii. 3). According to Tan., Beḥuḳḳotai, 7, and Midrash Haggadah to Lev. xxvii. 2, even when Jephthah made the vow God was irritated against him: "What will Jephthah do if an unclean animal comes out to meet him?" Later, when he was on the point of immolating his daughter, she inquired, "Is it written in the Torah that human beings should be brought as burnt offerings?" He replied, "My daughter, my vow was, 'whatsoever cometh forth of the doors of my house.'" She answered, "But Jacob, too, vowed that he would give to Yhwh the tenth part of all that Yhwh gave him (Gen. xxviii. 22); did he sacrifice any of his sons?" But Jephthah remained inflexible. His daughter then declared that she would go herself to the Sanhedrin to consult them about the vow, and for this purpose asked her father for a delay of two months (comp. Judges xi. 37). 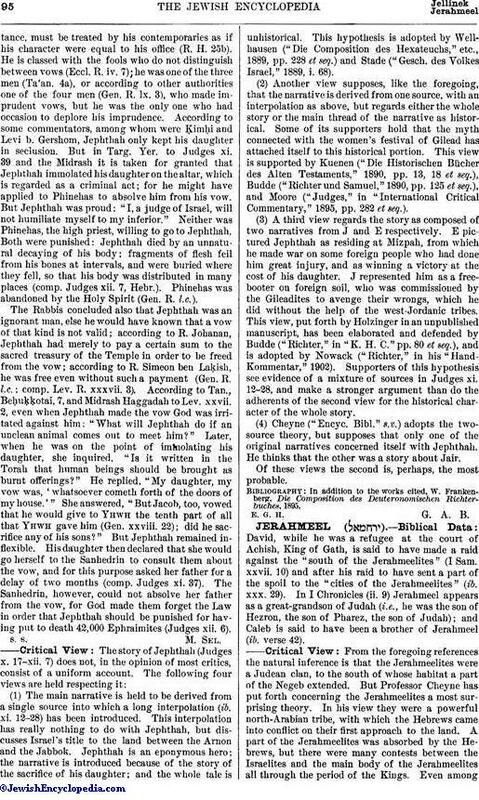 The Sanhedrin, however, could not absolve her father from the vow, for God made them forget the Law in order that Jephthah should be punished for having put to death 42,000 Ephraimites (Judges xii. 6). (1) The main narrative is held to be derived from a single source into which a long interpolation (ib. xi. 12-28) has been introduced. This interpolation has really nothing to do with Jephthah, but discusses Israel's title to the land between the Arnon and the Jabbok. Jephthah is an eponymous hero; the narrative is introduced because of the story of the sacrifice of his daughter; and the whole tale is unhistorical. This hypothesis is adopted by Wellhausen ("Die Composition des Hexateuchs," etc., 1889, pp. 228 et seq.) and Stade ("Gesch. des Volkes Israel," 1889, i. 68). (2) Another view supposes, like the foregoing, that the narrative is derived from one source, with an interpolation as above, but regards either the whole story or the main thread of the narrative as historical. Some of its supporters hold that the myth connected with the women's festival of Gilead has attached itself to this historical portion. This view is supported by Kuenen ("Die Historischen Bücher des Alten Testaments," 1890, pp. 13, 18, et seq. ), Budde ("Richter und Samuel," 1890, pp. 125 et seq. ), and Moore ("Judges," in "International Critical Commentary," 1895, pp. 282 et seq.). (3) A third view regards the story as composed of two narratives from J and E respectively. E pictured Jephthah as residing at Mizpah, from which he made war on some foreign people who had done him great injury, and as winning a victory at the cost of his daughter. J represented him as a free-booter on foreign soil, who was commissioned by the Gileadites to avenge their wrongs, which he did without the help of the west-Jordanic tribes. This view, put forth by Holzinger in an unpublished manuscript, has been elaborated and defended by Budde ("Richter," in "K. H. C." pp. 80 et seq. ), and is adopted by Nowack ("Richter," in his "Hand-Kommentar," 1902). Supporters of this hypothesis see evidence of a mixture of sources in Judges xi. 12-28, and make a stronger argument than do the adherents of the second view for the historical character of the whole story. (4) Cheyne ("Encyc. Bibl." s.v.) adopts the two-source theory, but supposes that only one of the original narratives concerned itself with Jephthah. He thinks that the other was a story about Jair.Of these views the second is, perhaps, the most probable. In addition to the works cited, W. Frankenberg, Die Composition des Deuteronomischen Richterbuches, 1895.